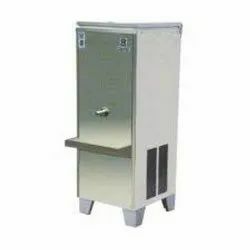 Prominent & Leading Manufacturer from Delhi, we offer drinking water cooler. 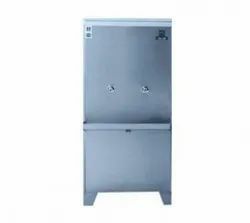 DRINKING WATER COOLER :-Stainless steel tanks wrapped with copper cooling coils for maximum efficiency providing running cold water at a refreshing temperature of 13.5 °C. Water coolers use a hermetically sealed compressor of high efficiency. An oversized condenser coil coupled with liberal sideways ventilation makes them highly energy efficient and gives longer life to the compressor. Hence the water coolers can be installed close to the wall saving space. The closed cell expanded polystyrene insulation protects the water cooler from breeding insects and bacteria. This is due to the non-porous insulation unlike the conventional systems where the glass wool, being porous, breeds insects and bacteria. Rust being the biggest enemy of water coolers is effectively kept at bay by powder coating after pre paint metal treatment through a 7 tank hot phosphatizing process. 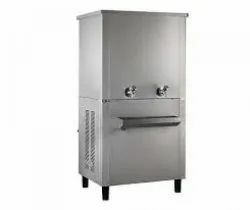 The cooler is mounted on stainless steel feet minimizing rust from the bottom and giving clear space for cleaning and for air movement to keep the water cooler dry. All the fittings and pipes which come in direct contact with water are made of non-corrosive materials.